Reg Park stars in this rather generic but unusually set Peplum filmed in South Africa. Alpha US R0 DVD. Writer/director Piero Regnoli, best known for his later work with Lucio Fulci (including White Fang (1973) and Demonia (1990)), takes both the writing and one of his few directoral credits for this production. 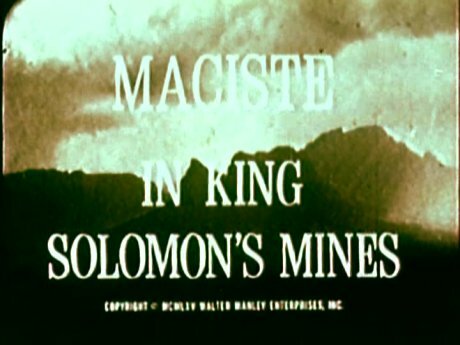 Despite the title, Maciste in King Solomon's Mines bears no apparent link to the famous H. Rider Haggard novel aside from the African setting. This location helps to set the film aside from the normal Pepla and explains the presence of Maciste in place of Hercules - an entirely fictional creation of the early Italian silent movie epics, Maciste has no ties to any particular historic period and appears in films set from Ancient Greece through to the 17th Century - the era of this particular film is never explained in the story. Unfortunately, despite the quite original location, the storyline is pure generic Peplum - an evil Queen who has seized power from a benevolent monarch thanks to betrayal and who the hero has to defeat. Familiar highlights include Maciste fighting off hordes of rather ineffective soldiers, getting put into incredibly elaborate torture situations and getting drugged by the Queen - scenes that should be familar to all fans of the genre. To compound the problems, the pacing is very slow and the film often feels like it should have lasted just 60 minutes, making it often very dull to watch. In contrast though the climax is all over too quickly and is fully predictable from the start. As director, Regnoli does a similarly generic job with the film and despite the real African locations (meaning we see a few giraffes that might as well just have been stock footage) there is nothing to make this film standout, apart perhaps from a few slow motion shots of Reg Park flexing that should keep the female audience happy (if they are still awake). Italian composer Francesco De Masi's score is lifted by a few interesting vocal parts, but they are few and far between and the film mostly uses a generic orchestral track. Reg Park, three time Mr Universe, takes on the muscleman role for his fifth and final Peplum appearance - in acting terms the role is not very taxing but he gets plenty of chance to show off his iconic build. Unusually he doesn't support a beard this time around, making him look about ten years younger. The rest of the case are relative unknowns and there are no real performance highlights. An interesting and quite original setting is completely wasted with uninspired production and a generic storyline that seems to drag on much longer than the ninety minute runtime. 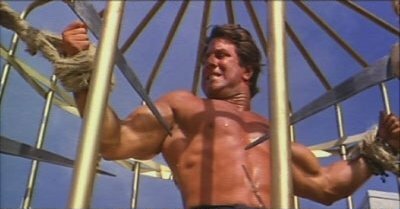 Reg Park never really gets much to say, but does get a few good chances to flex. Nothing worth tracking down except for Reg Park completists. Anyone famous in it? Reg Park - the British muscleman who appeared in five Pepla during the genre's boom in the 1960s. Directed by anyone	interesting? Piero Regnoli - little known as a director (his only other credit of note is The Playgirls and the Vampire (1962)) he did a lot of work as a writer, penning several Lucio Fulci production, as well as zombie film Burial Ground. Who is it for? One for Reg Park and Peplum completists only. A generally very poor print with constant print damage and noticable lack of detail. Colours are so faded that the print often appears to be sepia. Not unwatchable but not far off. Audio English mono - a persistant humming on the soundtrack but the dialogue is clear. Availability Only available as part of a double-film release with the Franco and Ciccio time-travelling Peplum comedy, Maciste Against Hercules in the Vale of Woe (1961) - a very grainy fullscreen print. Listed as fullscreen with Italian and French audio only. Some images are available that might be from this release or could be from television broadcasts, showing massively improved picture quality over the Alpha disc. Cuts? Cut status unknown. The print used is English language. An interesting setting but a very generic film and only worth tracking down for Reg Park completists. A very poor print but it is watchable and the only way to see this film with English options. Better prints appear to be available elsewhere. Find our reviews of other Peplum Films and films starring Reg Park. All text in this review written by Timothy Young - 24th March 2008.